Firestone Lap Sealant is specifically designed edge treatment used to ensure a watertight seal while seaming two EPDM liners or flashing. Firestone Lap Sealant is specifically designed edge treatment used to ensure a watertight seal while seaming two PondGard EPDM liners. This adhesive caulk serves as a final precaution against leaks and is applied to the outer edge of a seam. 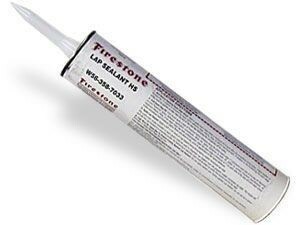 Firestone Lap Sealant applies easily using a caulk gun. Use the 6" single sided tape. Thoroughly clean the liner area using Primer and an abrasive pad. Wipe clean with a paper towel. Remove the paper backing and apply the tape being careful to provide a smooth cover. Roll to provide pressure to all areas of the tape. Apply Lap Sealant to the tape edges for the final step and allow to dry for several hours before contact with water. Surfaces to which Firestone Lap Sealant HS is applied must be clean, dry, free of foreign materials and excess dusting agent. Clean with broom or rags if necessary. Wait to apply seam edge treatment a minimum of 4 hours after completion of a flashing unless weather is threatening. If weather is threatening, apply Firestone Spllce Adhesive to the edge of the flashing splice (next step below) before leaving the project. If weather is not threatening, the seam edge must be applied no later than the end of the next day following the completion of the seam. Apply a layer of Firestone Splice Adhesive along the entire seam edge, a minimum of 1" on each side of the step-off following current Firestone Splice Adhesive application procedures. Allow the Splice Adhesive to flash off (get tacky). Note: If the seam edge has beeen contaminated, clean the seam edge a minimum of 1" on each side of the step off with Firestone QuickPrime Plus and allow to dry, prior to application of the seam edge treatment. Apply a continuous bead of Lap Sealant HS approximately 3/8" x 1/4" centered over the flashing seam edge, using the plastic nozzle applicator supplied by Firestone. Be sure to keep the nozzle applicator centered over the lap step off. Refer to seam details. From Steve Currie of Kure Beach, North Carolina on 12/7/2015 . From effie diakos of east marion, New York on 6/5/2014 . 9/15/2015 – How long does it take after applying sealant can you safely add fish. How do you tell if the sealant is dry? 12/19/2013 – what is flash off? 8/14/2013 – will it qualify as a bituthene mastic?